Get a free no-obligation quote for your van. Find Your Next Van Search our new van offers or use the used van search bar at the top of the page to find the perfect one for you. Established New Van and Used Van Dealership in North Cheam, Surrey. Based in North Cheam in Surrey, we supply high-quality new and used vans to businesses across the UK. We’re part of Wilsons – a family-run business that’s grown to become one of the largest dealerships in the South of England. Our aim is to help every business get the vans they need to run a successful company. We want to make your life easier by supplying vans that help you every day, ones that you can rely on and become true assets to your business. You will find a wide range on offer through us, from small vans and car-derived models to huge workhorses and pick-up trucks. Whether you need a traditional panel van to make deliveries, or a large van for passengers to run a taxi firm, we’re sure that we can help you find a vehicle that fits the bill. We stock vans from brands such as Renault, Nissan Citroën and Vauxhall for you to choose from. When you find a van that suits you, we will make sure you can enjoy driving it almost immediately with deliveries across the UK. If you are located within 20 miles from us, we will deliver to you free of charge. 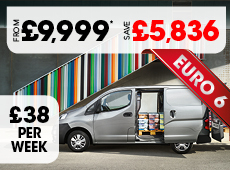 We stock over 500 models, so we’re confident that we can get your van of choice over to you quickly. We will make sure the van you would like is cost-effective for your business with a suitable finance plan. We create them based on exact requirements and can come up with a solution for every need whether you’re after a single van or a full fleet. Visit us to browse the range, or get a feel for what’s currently available using the search tool above. To find out more about a van and our finance options, contact us to arrange an appointment where you can enjoy a test drive. Call or enquire online via Live Chat. *For Scotland and Wales deliveries, please call for a quote. Part Exchanges cannot be collected they must be brought to us. **Price promises are only applicable on like for like vehicles. ALL NEW AND USED PRICES ARE SUBJECT TO THE RELEVANT ROAD FUND LICENCE FEE AND ALL NEW/PRE-REGISTRED VEHICLES WILL BE SUBJECT TO THE REGISTRATION FEE. ALL NEW/PRE REGISTERED VEHICLES ARE SUBJECT TO MANUFACTURER DELIVERY CHARGE. USED VEHICLES ARE SUBJECT TO A £50 ADMINISTRATION FEE. ALL IMAGES ARE FOR ILLUSTRATION PURPOSES ONLY AND MAY NOT BE AN EXACT REPRESENTATION OF VANS IN STOCK.